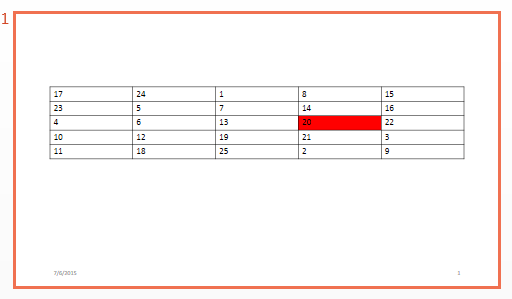 tableEntryOut = entry(tableObj,row,column) returns the table entry for the specified column of the specified row. Color the table entry in row 3, column 4. Table containing the entry, specified as an mlreportgen.ppt.Table object. Table row containing the entry, specified as a double. The double is an index number indicating the position of the row. The number of the top row is 1. Table column containing the entry, specified as a double. The double is an index number indicating the position of the column. The number of the left column is 1.